Cat5e splitters enables two different devices to share the same cable. They are usually used in pairs, one at the outlet and one at the patch panel. 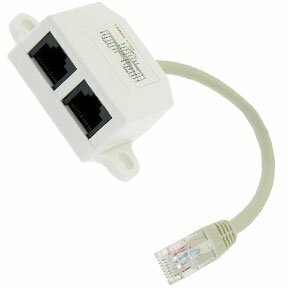 Cat5e splitter adaptor allows two computers to share one Cat5e port. Network T splitters are available at SF Cable to align with your networking requirements. You can choose from a variety of Network T splitters according to your needs. We have pigtail type wiring splitters with different specifications. Order the one that suits your requirements and get the delivered at your doorsteps. All our products are manufactured by ISO 9001-2000 registered manufacturers to provide highest quality of products. The products on offer are RoHS compliant and environment friendly as well. Moreover, all the products are offered at very competitive prices and are eligible for lifetime technical support by SF Cable.